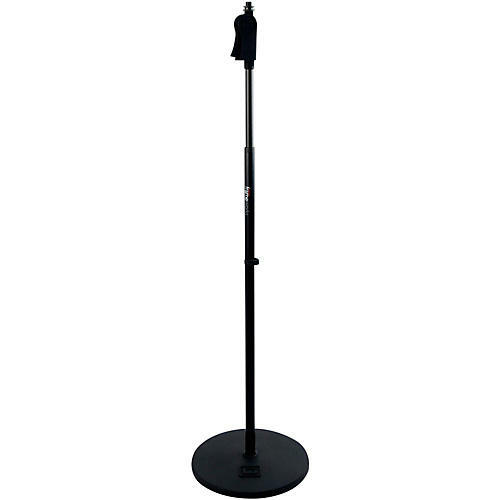 This Frameworks mic stand has a 12" round base mic stand with a deluxe one-handed soft-grip clutch, no-slip vibration reducing gasket, cable management, and is compatible with US and Euro mic clips. It has a minimum height of 40" and maximum of 63". We are proud of our products and want you to be proud to use them. Gator Cases products are covered under warranty against manufacturing defects in materials and workmanship for the original owner with proof of purchase from an authorized Gator dealer. Upon acceptance, Gator Cases, will repair or replace any product found to be defective. Damages due to normal wear, improper care, modification, negligence, rental purposes and accidents, where Gator Cases is not at fault, are not covered. Please keep your receipt so you have proof of purchase or register your case with the registration card that came with it. International warranty claims will be handled through the local distributor. Do not hesitate to contact us with any warranty question or claims.